As you may know, I am a serious student of the history of industrial management, specifically the origins and evolution of Scientific Management and its linkages to the origins and evolution of Toyota’s Production system (TPS, popularly known as “Lean production” from 1987 to 2007 and “Lean management” post-2007). This includes the life and times of Frederick Winslow Taylor, the father of Scientific Management, as well as the evolution of The Taylor Society, which was formed after Taylor’s death in 1915. I have been going back through my old books recently to once again study the evolution of Scientific Management between about 1890 to late 1920s. Had the Lean movement been aware of this history, many mistakes and frustrations might have been avoided. Let me share with you some important aspects related to Scientific Management and how it evolved over this 30-year period. Much of this will sound familiar to you in the context of Lean, and therein lies one of our problems: Not learning from history. The leaders of Scientific Management were overconfident in their aims and their ability to influence business leaders. While important innovations in management were made (and critical to the success of wartime efforts), many of which remain with us today, the Scientific Management movement’s success relative to its expansive vision was far less than Taylor and his followers had hoped for. The Scientific Management community was both part of business yet separate from it. They operated at levels below the C-suite, and were never able to become fully part of the executive office, except for in a hand full of cases. Within companies, Scientific Management engineers did not / could not / were not allowed to cross boundaries into the top levels of corporate leadership and influence its policies, thought processes, strategies, or decisions. Scientific Management practitioners were of a different rank – a lower order – than the executive, despite their view of themselves as right in matters of fact and more capable of business leadership. Engineers became seen by CEOs as insufficiently motivated by profits to lead, while engineers saw CEOs as too tainted by the profit motive (and the “cesspool of commercialism”) to understand and embrace Scientific Management. To help gain a wider audience, Scientific Management orthodoxies were eventually loosened. In contemporary terms, inclusion of six sigma, change management, and similar things have been permitted entry or welcomed into Lean management. In the vast majority of cases, the audience for Scientific Management had no interest in and (being a lower order than the CEO) was incapable of completely changing an organization’s system of management. Tweaking the existing management system was good enough. The initial focus of Scientific Management on production eventually gave way to new areas of application such as Scientific Management in sales, purchasing, the office, government, the home, and so on. Scientific Management, developed to serve sellers’ markets, had difficulty adjusting to the emergence of buyers’ markets staring around the mid 1920s. Toyota (specifically, Taiichi Ohno et al.) solved this problem some 35 years later. The early focus on individuals and centralization of authority for work evolved into a focus on groups, teamwork, and more decentralized authority for how to do the job. In contemporary terms, the focus on teamwork has given way to a focus on individuals; e.g. coaching kata. The emphasis on “money-making” possessed by the CEO was seen as evidence for the need to transform business into a profession through the development of “technical knowledge, training, and discipline” which Scientific Management could bring, therefore resulting in competent and dignified leadership. The same need for professionalism exists today. The profit motive was a “controlling influence” on the CEO. That, in addition to corporate survival and market dominance meant that Scientific Management would never be influential with the CEO rank despite its potential to deliver greater profits. The same situation exists today, with additional need to generate great personal wealth to satisfy selfish interests. In its day, Scientific Management greatly influenced the thinking of social and political progressive leaders, and vice versa. Little or no such influence among social or political leaders existed between 1985 to 2016. Perhaps that will change in the future. The engineer’s facts (from time studies and other industrial engineering methods) could not overcome the subjective opinions of leaders (CEO rank) or their corporate socio-political interests. They could not get top leaders to see work scientifically. In large organizations, the middle management problem – resistance to change – went uncorrected because its causes were not well understood. This problem exists today, though its source is well understood (Lesson 45 in Lean Is Not Mean). With few exceptions, CEOs and CFOs were unable to grasp how wages for workers could be high while simultaneously having low costs. This remains true today, despite the “professionalization” of management via business school education. With few exceptions, workers resisted Scientific Management because they did not believe high wages would be forthcoming, or that higher wages would be arbitrarily cut by management. To the CEOs, high wages as perceived simply as high wages, while higher productivity was seen as something they should get for free in perpetuity. Workers and labor unions were also concerned that Scientific Management would bring about diminution of skills and loss of control over the work. These concerns remain with us today. Neither Taylor nor the aims of Scientific Management were hostile to labor unions. The view was simply that unions were unnecessary because management would fully satisfy workers’ financial and other needs in those companies where Scientific Management was “installed.” Later, Scientific Management leaders came to accept collective bargaining as necessary response to exploitative industrial conditions. Labor unions would eventually ally with Scientific Management because it was seen as a way to strengthen unions and maintain higher wages for workers. CEOs preferred to spend money on productivity-improving technologies and equipment versus improving work processes. To them, the former was recognized as a sure thing, while benefits from the latter were uncertain. This remains true today as well. 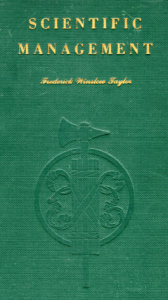 The new field of management consulting consisted of a small group of consultants faithful to Scientific Management and Taylor’s orthodoxy, and a horde of consultants who claimed to be experts in Scientific Management but who immediately adulterated Taylor’s orthodoxy and made use of any device or method that improved efficiency (they were called “charlatans”). This created great confusion in the marketplace over what Scientific management was or was not. The adulterous consultants were far more successful than the consultants who faithfully adhered to Taylor’s orthodoxy. Ultimately, Scientific Management did not do enough for the worker in terms of improved pay and working conditions, principally due to misunderstanding and malpractice by supervisors and mid-level managers. Scientific Management did not seek to, and, later, was unsuccessful in engaging those in the C-suite, whether to improve the business, professionalize business leaders, or advance its own interests. Henry Gantt, a close associate of Frederick Winslow Taylor, had a maxim that said: “The usual way of doing a thing is always the wrong way.” Based on the history and evolution of Scientific Management, it seems that the approach taken to advancing Lean management has been the usual way of doing a thing. As usual, concise and on point – thanks! Can’t argue with you about the benefits of learning from history, especially just after you used history to demonstrate that learning from history is a good idea. More urgently, what can we do with what we’ve learned from how Scientific Management got distorted to raise the probability of meaningfully expanding application of Toyota Way/21st Century management? Has the constellation of forces that warped SM altered in fruitful, substantive ways? Have we clever enough options now we see better what happened to SM and how that happened? More bluntly, is such a transition even engineerable? Or does capitalism mostly just evolve? Hi Jeff – Thanks for your comment. Of course there is no easy answer. I’ve offered some countermeasures in various of the REAL LEAN books. The countermeasures are best discovered via a team effort; a team of people looking at the past state of Scientific Management, the current state of Lean management, and the desired future state of Lean management. Who that would be is a good question. The Big Influencers seem trapped in their own Lean bubble and likely will not recognize the existence of the past history that I have pointed out or acknowledge its significance. If they did, I suppose they would convene among themselves and invite others to together figure out how to move forward (I suspect I would be unwelcome among such Lean nobility; yes, there is such a thing as Lean nobility). Short of that, capitalism and management therein will simply take it course, as you suggest. I recently learned about your blogs and started reading them. Very interesting and insightful to read your thoughts on the origins of Scientific Management and Lean. It inspired me to get to meet Taylor and others again for the first time, as in not reading about them but learning from them and all who came after them. Regardless of how imperfect Scientific Management, Lean and TPS have been pursued, the underlying principles and ideals are noble. As to the failure of Scientific Management to be adopted and succeed, I agree with your observations. But there is also Peter Rossi’s “Iron Law”, evaluating studies of the impact of social programs, that argues that as a new model is implemented widely across a broad range of settings, the effect will tend toward zero. Hi Paul – Thank you for your comment. In so far as Lean is considered a social programs, Peter Rossi’s law may indeed apply to net impact. Yet, the gross impact on a localized basis has been shown to be much greater than zero. I suppose that’s one of the things that keeps us going.